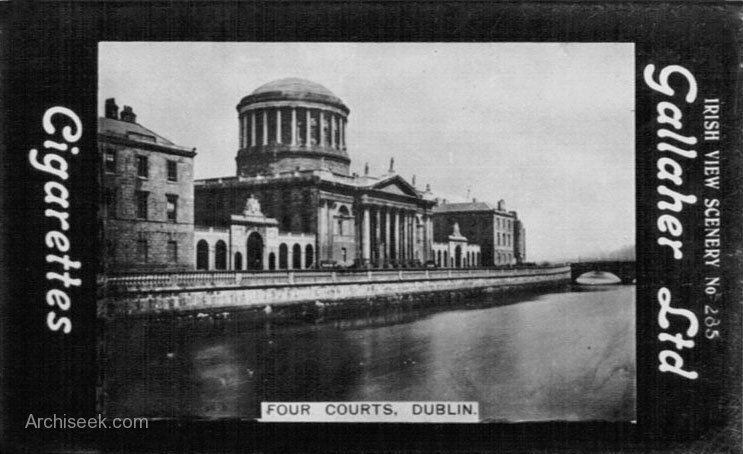 One of the landmarks of Dublin with its large drum and shallow dome, and visible all along the Liffey, the Four Courts derives its names from the four divisions that traditionally were the judicial system in Ireland. 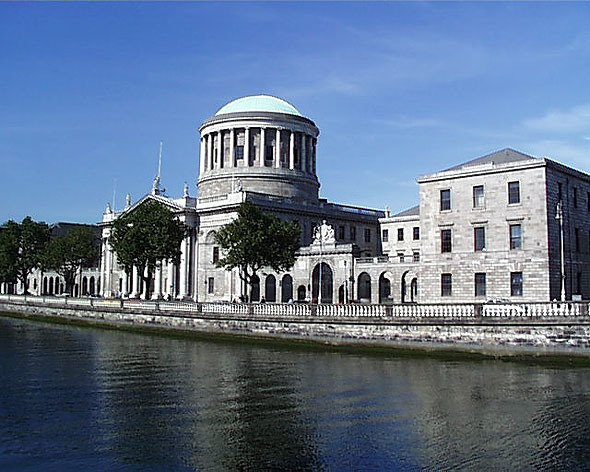 These were: Chancery, King’s Bench, Exchequer, and Common Pleas. 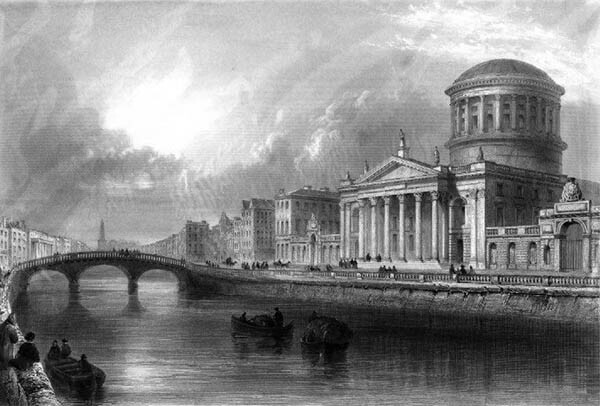 Originally, part of the building was designed by Thomas Cooley with a revised later scheme being developed by James Gandon to incorporate the earlier work. 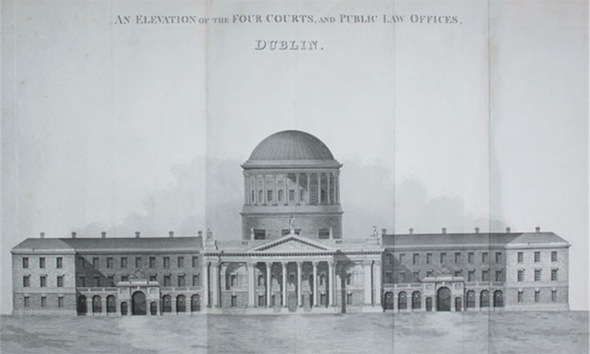 The original plan of the western block designed by Thomas Cooley consisted of a number of separate ‘houses’, each with its own entrance and stairwell. The eastern block designed by Gandon was one building with complete internal access. 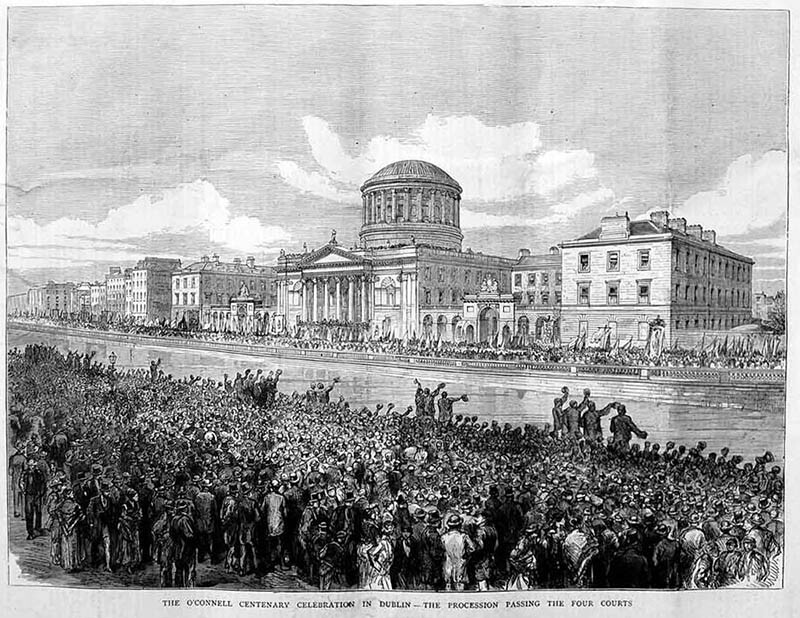 This can be seen on the plan below with Cooley’s block on the left. 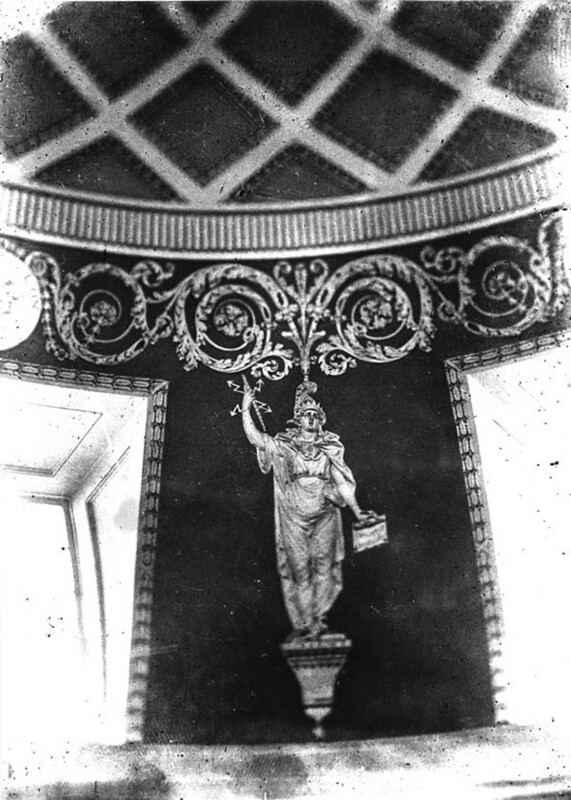 The building’s main feature is the dome and main portico. 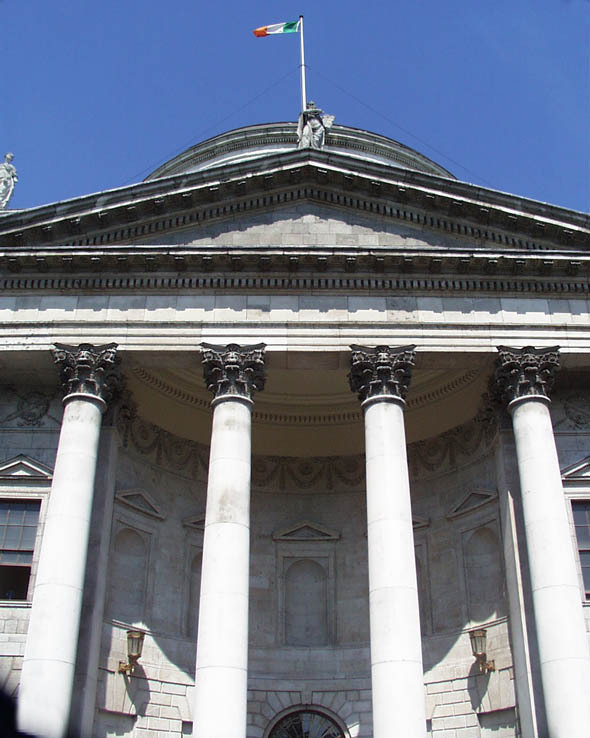 The portico and pediment are a shallow projection from the centre block but Gandon created a semi-circular recess under the pediment bringing the entrance into the building. 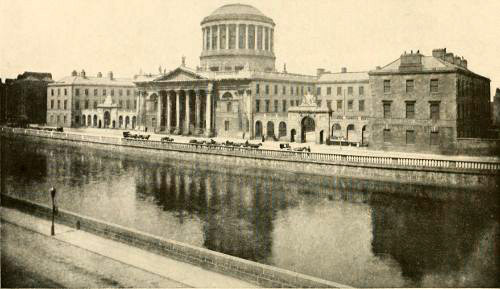 Described in 1837, “The courts are held in a magnificent structure, commonly called the Four Courts, situated on the north side of the river, having Richmond and Whitworth bridges at its eastern and western extremities; it consists of a central pile, 140 feet square, containing the courts, and two wings, in which are most of the offices connected with the despatch of legal business: these, with the centre, form two quadrangles. 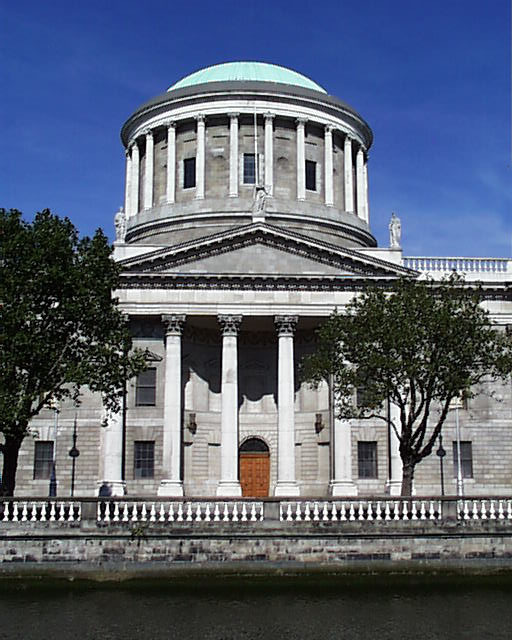 The front of the building consists of a boldly projecting central portico of six Corinthian columns on a platform, to which is an ascent by five steps, and supporting a highly enriched cornice surmounted by a triangular pediment, having on the apex a statue of Moses, and at the ends those of Justice and of Mercy. Through this portico is the principal entrance into the great circular hall, opposite to which is a passage to apartments connected with the courts, and on each side are others leading to the two quadrangles. 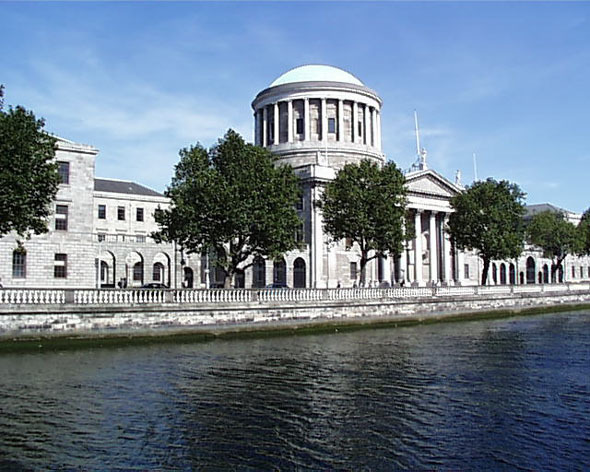 In the intervals between these four passages are the entrances to the four chief courts; the Chancery on the north-west, the King’s Bench on the north-east, the Common Pleas on the south-east, and the Exchequer on the south-west. 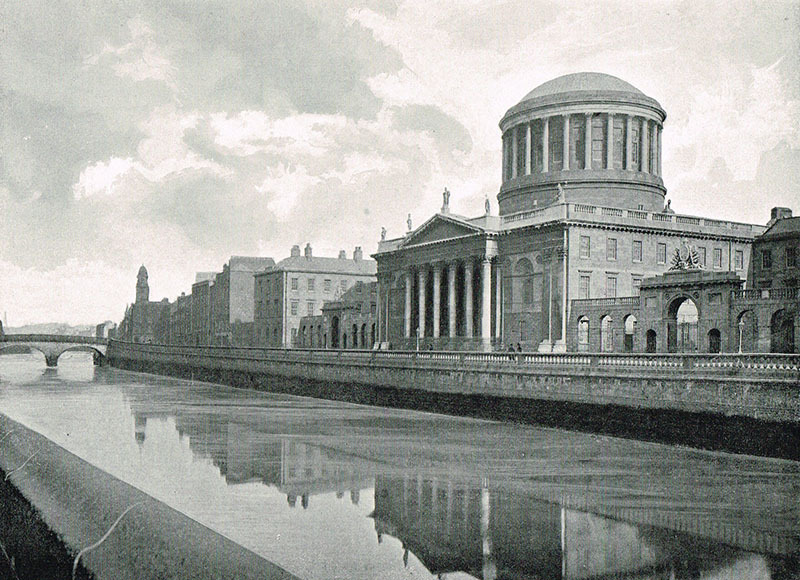 Like all of Gandon’s buildings, the Four Courts was completed with excellent sculpture by Edward Smyth. 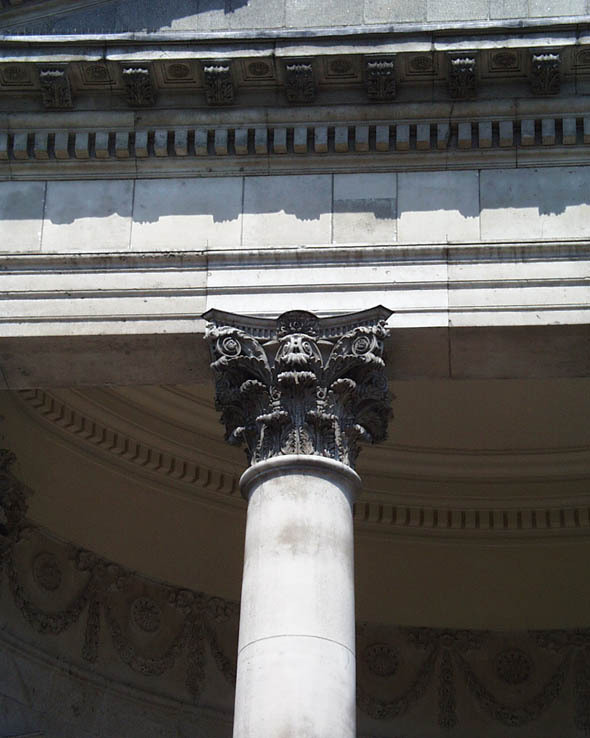 On the main pediment, Moses is flanked by Justice and Mercy with Wisdom and Authority also present. 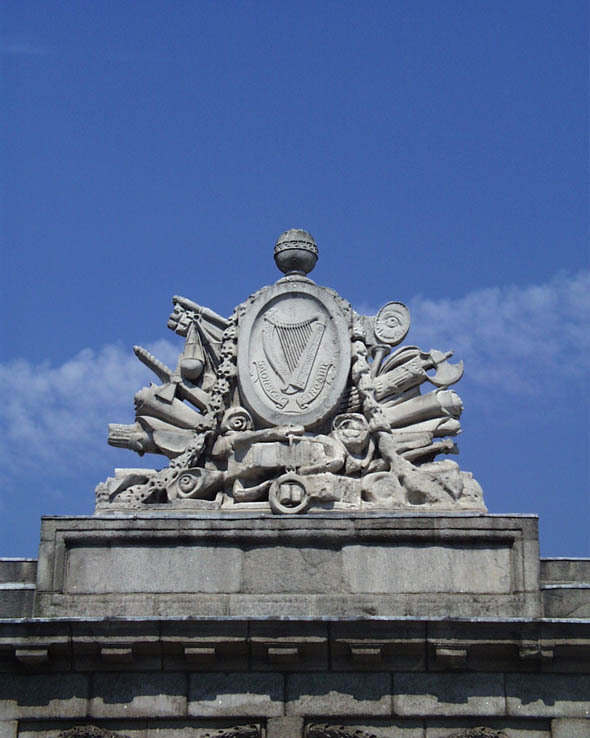 Trophies of arms are placed over the triumphal arches in the arcades but they had been emasculated with the crowns replaced by balls. 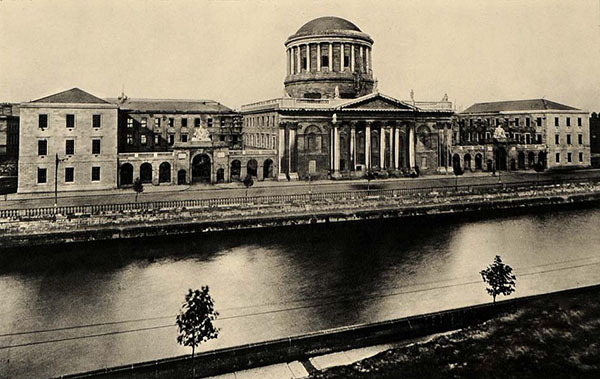 Destroyed during the Irish Civil War of 1921-22, the building has since been restored externally although it was remodelled and rearranged internally. 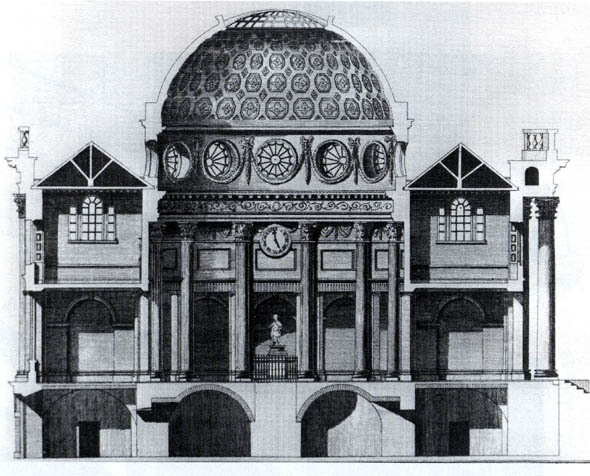 The only external changes was the removal of one bay from each of the side blocks so that they no longer project beyond the arcades as was originally intended by Gandon and shown in the plan above.